Creation #179. Bonsai Wisdom 3. This one happened a little differently in my head. No worries, it is still a candidate for refinement. And I have a few more ideas lined up. More concepts to come! Creation #178. Bonsai Wisdom 2. 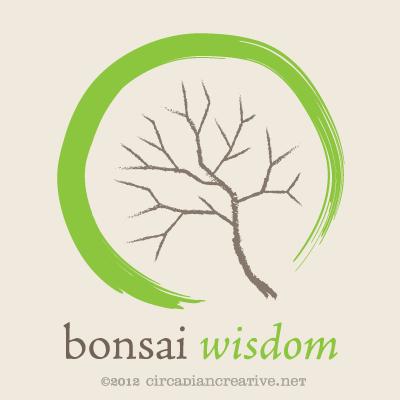 Creating tonight’s version of the Bonsai Wisdom logo has inspired me with even more ideas. well, actually one more idea, which may just be the one. Here is where I stopped this evening. More and hopefully better concepts to come! 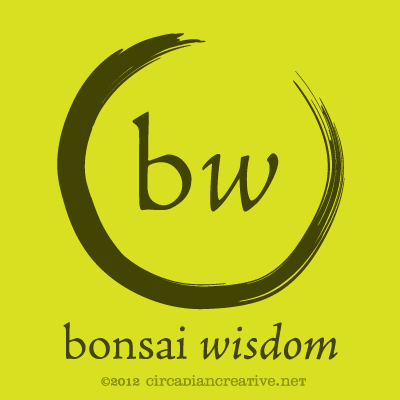 Bonsai Wisdom is an idea I have been bouncing around for about a month now. If I ultimately deem it worthy of existing it will become yet another personal project. It actually would not become a completely new task for me as it will largely coincide with my existing bonsai maintenance routines. In fact it may help me to improve the quality of that routine and subsequently the quality of my trees. 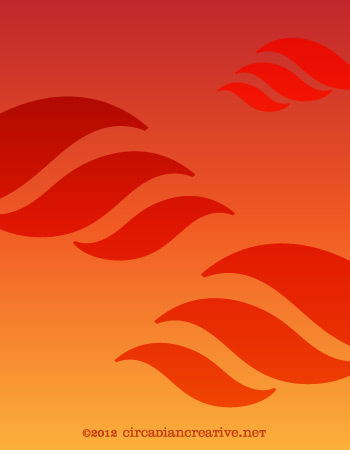 I will not share the entire concept all at once but will start by sharing my first logo mock up. 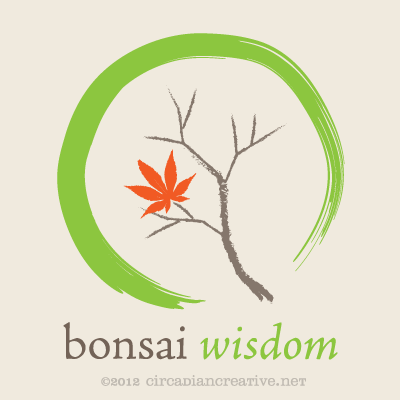 The circular, brush stroke shape is a common archetypical symbol of Zen. I am still thinking about the typography but I the best choice will be an Oldstyle or Classical typeface and I believe Adobe Jenson fits the bill quite nicely. Color has also not been decided on, but I found the dark gray and bright green combo to be rather refreshing, for now. Today I am still using the typeface Lobster but I’m not going to title the piece Lobster #3. I decided to use an expression and typeset it with some appropriate graphic shapes. 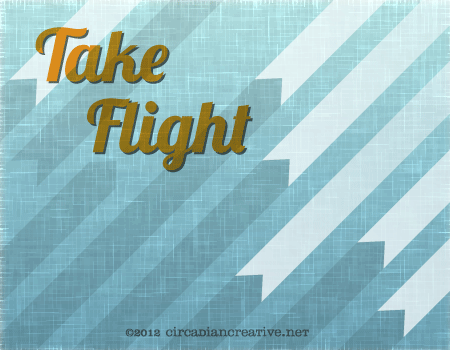 Today I chose the phrase take flight after rotating the arrow shapes. They were the first words that came to mind so I went with it. If you have a phrase or expression you’d like to see me use just comment below and I’ll see what I can do! So I think I am going to pursue a few designs around the typeface Lobster. Here is my second design. Not sure how I will be handling this theme but I do like the typeface despite the fact that it is gaining widespread overuse. Once you get the hang of identifying it you will notice that it is common on many webpages these days. Tonight I am proud to post a creation that I actually created last weekend. I did not want to publish it then because it is sort of a branding item. I have finally completed my design for Bonsai Empire which provided me with many daily designs. We just approved the compiled image a few short hours ago! The illustration I present to you today is a character I created for the Bonsai Empire project. 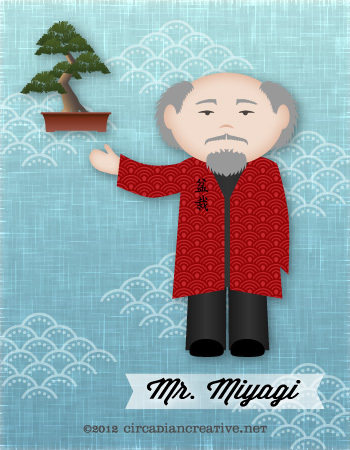 His name is Mr. Miyagi and he is making his debut in an info graphic that I have spent the past several weeks working on. I am extremely pleased with how the design came out, and more importantly, Bonsai Empire loves it as well! They have published the piece on their website and will begin promoting it tomorrow! Today I was discussing typography with a fellow designer. A trendy typeface came up and after some thought I decided to use it in my daily design. The typeface is called Lobster and it was designed by Pablo Impallari. 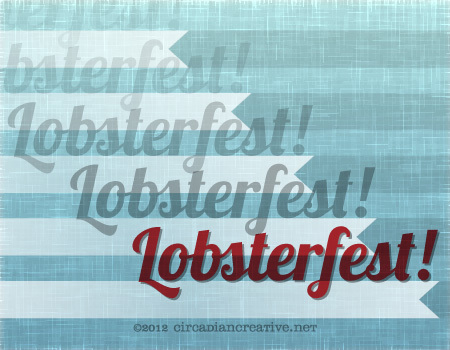 I planned to type set the word “Lobsterfest!” in a creative way but some how became focused on the tilde character and created what you see below. The lobsterfest will have to wait for another day I suppose. Hope you like.